Your new family addition has the cute, saggy, cheeks, an unmistakable boxer trait. Or, maybe your long-loved pet needs a diet change. Regardless of your need to know the best dog food for boxers you’ve found yourself here looking a short list of thoroughly researched dog food products. The goal? To review each product so you can choose what’s best for you and your furry family member. Don’t let the fancy brands distract you with adorable commercials of running puppies. The five top products are brought together to show that “the-proof-is-in-the-pudding”. Everything you need to make a final decision is in one place for you! There’s a lot of talks right now about what goes into a great dog food. Not to mention the tons of scandals on big brands that have claimed to deliver top quality for years, now only for the general public to find out that wasn’t the case. But, what’s best for your boxer? They have special needs and are one of the most popular breeds found in American homes. Boxers are well-known for their charming personality, playful nature and love of people. This is why they’re a top choice for nearly anyone. Their easy-going disposition, playful personalities, and easy to care for coat make them a favorite breed of individuals and families. But, what good choice will help them maintain the muscular build? Is there a formula with kibble shaped to accommodate the compact faces of boxers? Can a dog food offer all the protein necessary while promoting healthy weight? This brand has built a name on providing exactly what a dog needs. Boxers benefit greatly from the naturally planned diet. Within the Taste of the Wild library, the High Prairie and Lamb varieties offer some of the best benefits for Boxers. They both offer high percentages of protein to sustain high-energy levels. Additionally, there is a sufficient amount of healthy fats which promotes good skin and prevents unnecessary shedding. This is a choice option for any life stage. As its protein, fat, and fiber content are well balanced for a breed that has digestive issues it can follow any pup long into their life. The ingredients list here is very transparent and built for dogs with sensitive stomachs and digestive tracks. Instead of using heavy filler grains that many dogs have allergies to, they’ve turned to vitamin dense starches. The price is a little steep for many happy dog owners. Although everyone wants to provide the best for their pets it is difficult to warrant spending so much per pound. However, if this can fit in your budget it is worth it. The other aspect that makes some pet owners shy away from Taste of the Wild is the unique taste that it has. It can make a transition to Taste of the Wild difficult to switch to. Especially if you have a stubborn pup on your hands. Royal Canin has made a name for themselves by catering to each breed need specifically. They meet the boxers needs by addressing the SMS skin issues allergies and high energy. This is one of the very few dog foods available that is made specifically with boxers in mind. 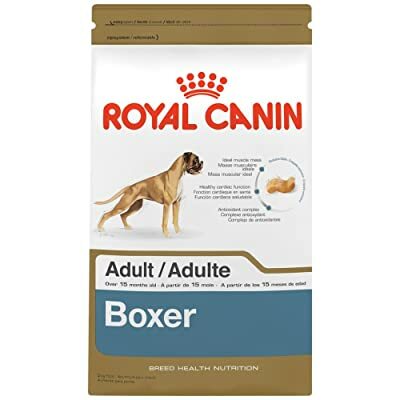 Boxers are less likely to experience bloating the kibble is designed so they must slow down during chewing and Royal Canin provides an overall easier digestion experience. They also addressed the unique issue that boxers experience. Cardiac sensitivity is something new owner wants to deal with. Royal Canin has additional nutrients including Taurine, EPA, DHA, and L-Carnitine. These nutrients work together to build a heart-healthy formula. The area that Royal Canin falters in is the ingredients. The first ingredient is brown rice, and you have to get to the third ingredient for any protein. But, when you get to the protein, it is a byproduct. This means that the protein isn’t as high-quality as some of the other alternatives on this list. This option is all about avoiding common allergens. So, it doesn’t contain any wheat, corn, or soy. But, they don’t stop there they also avoid colors and flavors that aren’t natural. 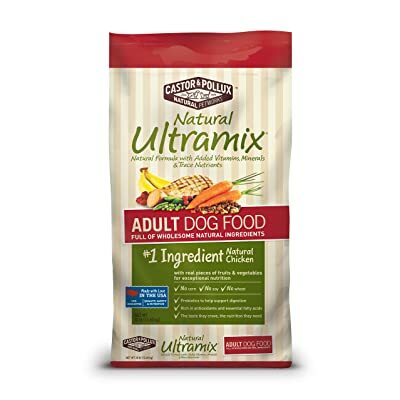 Natural Ultramix aims to deliver quality dog food and they don’t disappoint. Overall the protein content is low but that seems to be this dog foods one downfall. The lack of protein can be drawn immediately to the use of byproduct rather than meat or meat meal. This is one of the most loved dog foods available and has won many awards to support it. It’s made in the USE and Orijen hasn’t brought down their standards over the years. Instead, they keep all their ingredients premium and go through rigorous quality inspection as well. This is one of the most expensive dog food options on the market. Hands down if you’re looking for a way to spoil your beloved Boxer, no doubt Orijen is an option. However, many people can’t budget for Orijen. The price is the only thing that disappoints, but it is reasonable when you consider the quality of the formula. 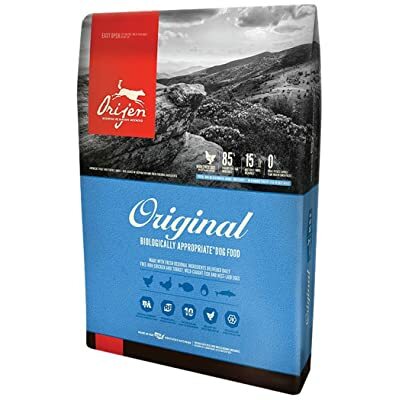 This dry dog food is made of about 90% meat that is raised and farmed by Orijen. 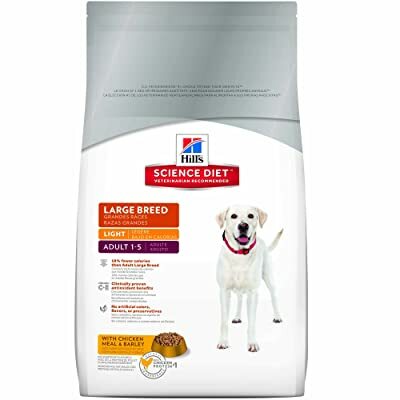 A top choice of many veterinarians and the staple in animal shelters, Hill’s Science Diet is one of the top options for pet owners on a budget. The boost here is from the L-Carnitine which helps the fat content burn off into energy. Science Diet is full of benefits for Boxers. The weight management and high energy formula are great for any Boxer that’s overweight or a little later in their years. This way, your pup can quickly shed off pounds without being restricted on how much they’re intaking. As always, speak with your family’s veterinarian before making any decisions on controlling your dog’s weight. Overall the downside of Science Diet is that contains fillers. Many people are driven to find a higher quality dog food because of fillers. Instead of the sweet potatoes, lentils and peas that many of the other dog foods on this list have there are a variety of grains and corn in Science Diet. Using these fillers means that there is a big possibility there will be some gastric distress during the transition. What do we mean by high-quality ingredients, and how do you spot them? Just as if you were grocery shopping for yourself, check the nutrition labels for the ingredients list. The ingredients list should be completely transparent. In other words, everything should be easy to identify and pronounce. If you see an ingredient that could as easily be a chemical as a prescription medicine, then it’s best to avoid it. For a long time, the ingredients list on dog food were completely ignored. Then they were so closely scrutinized that everything seemed terrible for our pets. One of the items more closely picked apart was what type of meat is appropriate for dogs. Often people assume that “beef” or “lamb” is the only appropriate ingredients. However, this isn’t the case. Meat meal which appears on ingredients labels as “Beef meal” or “Chicken meal” is a concentration of meat. Unlike “byproduct” it isn’t a construct of rejected parts. Instead, this offers a protein that has less water content and more protein. Just like us, a sudden change in diet can be traumatic on their digestive track. Instead of shocking their system by suddenly eliminating all the chemicals they’ve grown used to, work their new diet steadily. Throughout the first week, make about ¼ of their meal the new formula and leave the rest as you normally would feed your pup. Throughout the second and third weeks gradually increase the amount of new dog food over the ratio of old dog food. At the end of three weeks, your pup should be getting entirely new dog food. This can help you and your pup avoid a ton of gastrointestinal distress. Usually switching diets right away leads to gassiness, vomiting, and uncontrolled bowels. Why is changing their doggy diet so rough on them? Well, each formula whether it’s dry or wet food has a unique build of fats, proteins, and fiber. If the new diet has higher quality proteins and more fiber it is reasonable that this is going to disrupt him. Just the same if they’re losing out on the fats that they’ve grown accustomed to their stomach goes into a form of shock. These are all great reasons why it’s best to slowly introduce a new dog food. Especially for the boxer breed that is particularly prone to bloat. 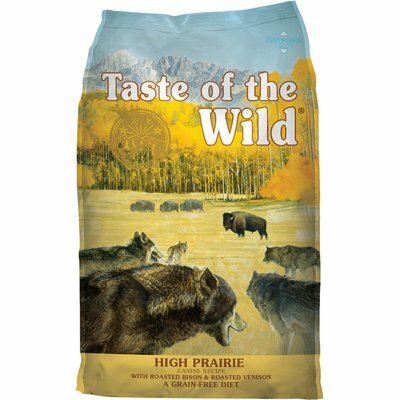 Taste of the Wild – High Prairie is the best food for boxers! This brand pride themselves on deliver high-protein based formulas to accommodate the meat-heavy diet of natural wild dogs. This has earned them a top spot and their ratings speak volumes about the quality of ingredients. Using peas, sweet potatoes, and potatoes to essentially bulk up the formula without making it entirely meat Taste of the Wild is a stable balance. The ingredients are all listed as what they are, rather than “meat byproduct” you will see “beef” or “bison”. Just the same you won’t find any grain-based products here. There are a ton of varieties and sizes available. This means that any combination can be the best value for you.